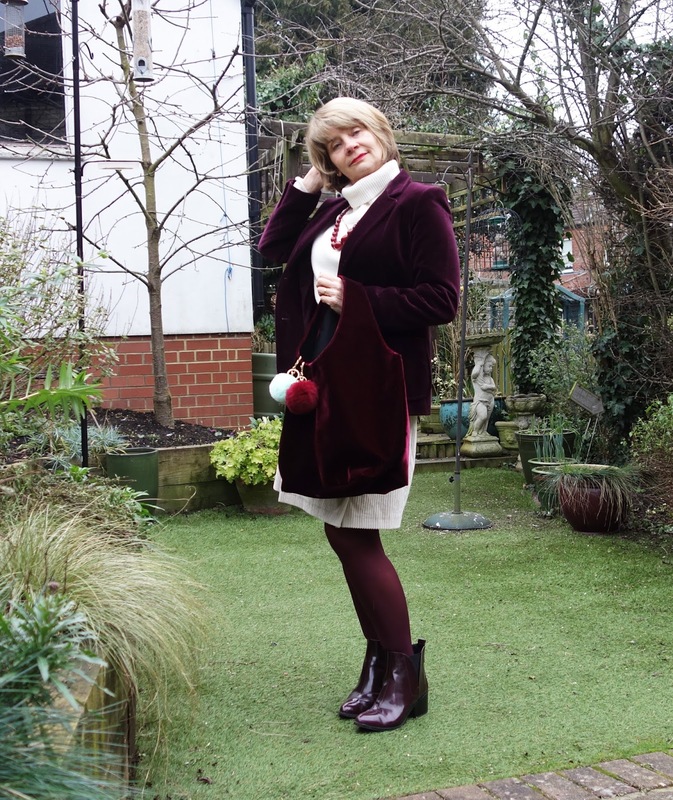 Velvet jacket 3 ways | Is This Mutton? 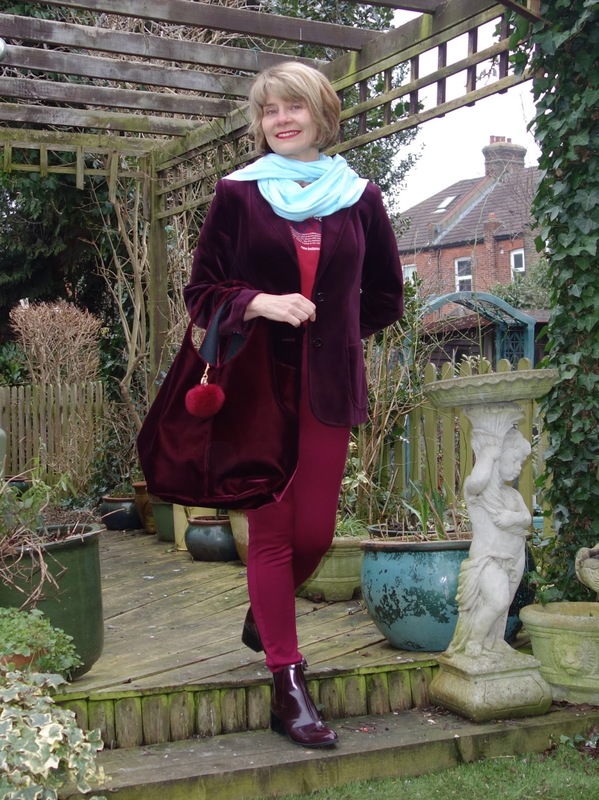 The latest challenge is to wear one velvet garment in three ways: casual, smart and dressy. 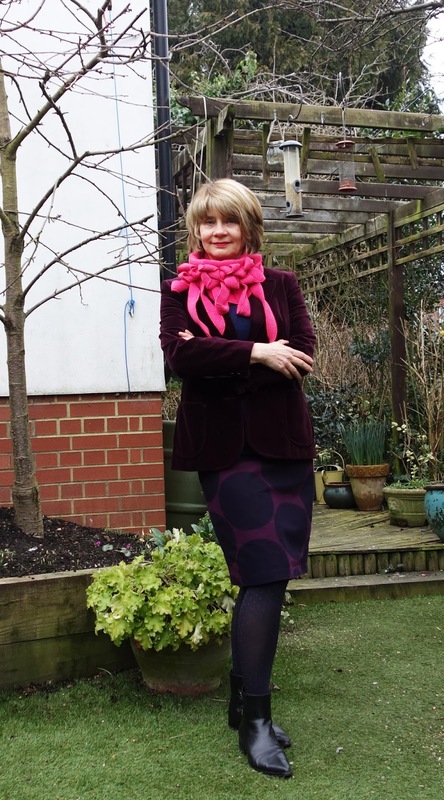 My velvet jacket was thrifted, originally from Marks and Spencer and pretty old judging by the St Michael label! But it's very good quality with velvet that holds its shape. I was thrilled when I found it because burgundy has suddenly become very desirable and there hasn't been much in the shops. My casual look features a t-shirt that will come as a surprise to Mr Mutton, seeing as it's his. It was the t-shirt he bought in 2007 when he successfully ran the Boston Marathon. I've paired it with burgundy / wine coloured jeans, ankle boots and velvet hobo bag. The scarf in duck egg brightens up the outfit and stops it being too matchy-matchy. I can't resist those pom poms either. Next up is my dressy interpretation. It's not dressy in terms of going to a party or cocktail bar, but I wore it to a restaurant recently so that qualifies for me. 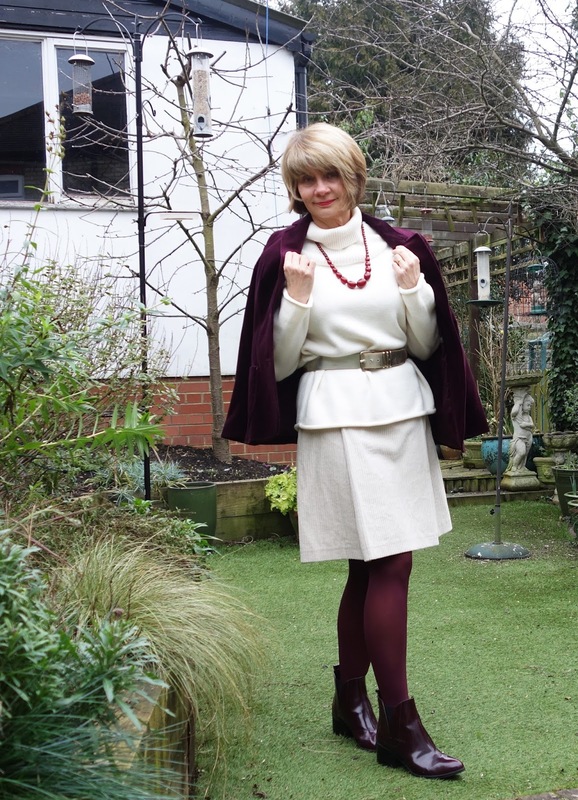 I added a cream Winser London baggy jumper and Boden cord skirt, both past season; burgundy tights and boots ,burgundy necklace and gold belt. Finally my smart interpretation. This would be a work outfit. 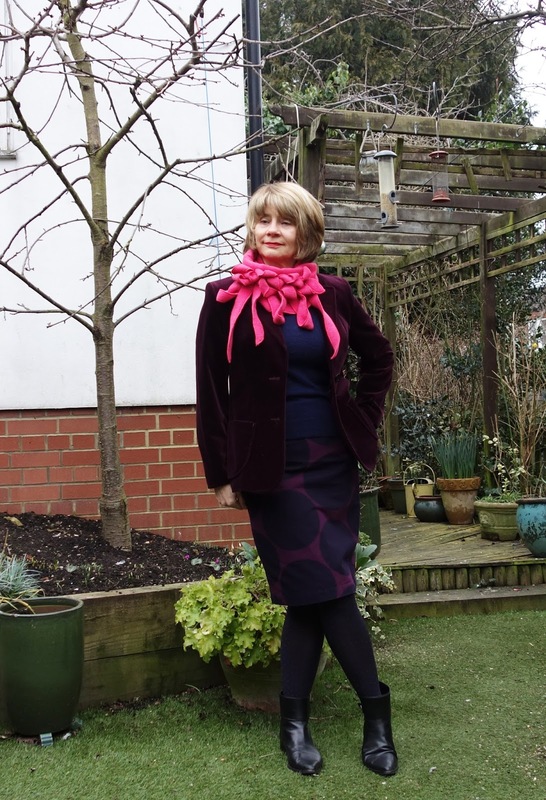 I used an old Boden skirt with a burgundy and navy print; navy opaque tights, black ankle boots and a navy cashmere jumper. The one accessory that brightens up the outfit is my one-button scarf from Rew. I love these scarves and wrote about them here. Sharing this post with Not Dressed As Lamb, Not Dead Yet Style, Elegantly Dressed and Stylish and Style Splash. What a great find that jacket was! I like both ways of styling Gail. Burgundy really suits you . I think that you did a fabulous job of remixing this jacket!! I admit that the dressy look is my favorite since I'm such a sucker for white--especially in the winter!! And you bring up a good point---thrifting can be perfect for the times you want a color that just isn't available in the retail stores!! Thanks again, for joining us for the theme Gail!! It's so much more fun to have others give their interpretation, too! So many great ways to style! Love this jacket. You created so many amazing looks with that gorgeous velvet jacket! A great line up of styles here Gail, but my favourite is the cream version. I really like the sharp contrast between the burgundy and cream. I sppose it's the one I'd most want to wear myself. Belt, beads, sweet boots - yes that all works for me. Very pretty Gail! 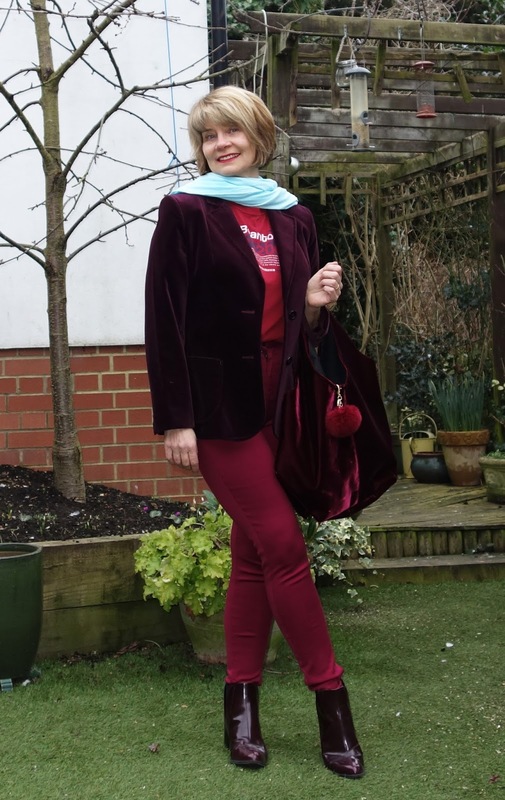 I am a velvet fan as you know, and the rich burgundy makes the outfit so dressy and stylish. I really love all 3 looks espcecially with the cream as it brings out the richer tone even more. I've been looking for a burgundy velvet jacket since before Christmas but haven't found the right one yet. I love the different ways you've styled yours. The bag with the pom poms is such fun and the pink scarf is beautiful, so unusual!